One of the biggest new changes in Office 2007 is the new mini toolbar that pops up when you highlight text and either right-click or move your mouse up. If you find the mini toolbar enhancement distracting, you’ll be glad to know you can disable it from automatically popping up when you select text. 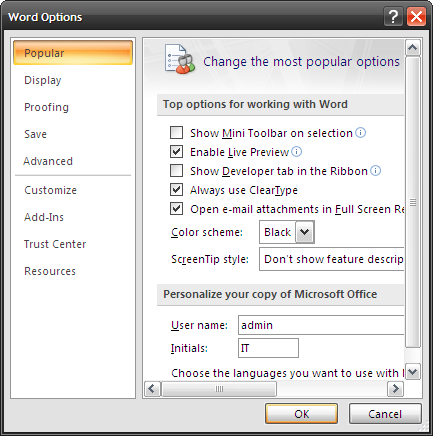 Click the Office Button in the upper left hand corner and select “Word Options” from the resulting menu to get to the Word Options dialog. In this dialog, select Popular and uncheck the “Show Mini Toolbar on selection” option. You can still get access to the Mini Toolbar by right clicking the highlighted text or anywhere on your document… it’s not possible to disable that.